Glympton is a village and civil parish on the River Glyme about 3 miles (5 km) north of Woodstock, Oxfordshire. The 2001 Census recorded the parish's population as 80. Grim's Ditch in the southern part of the parish, just north of Grim's Dyke Farm, was dug in the 1st century. The surviving section is about 1,100 yards (1 km) long and is a scheduled monument. The first known record of Glympton's existence is a charter from about AD 1050 in which it is given as a witness's address. In the reign of King Edward the Confessor, Wulfward the White, a thegn of Edward's consort Queen Edith, held the manor of Glympton. Wulfward survived the Norman conquest of England but by 1086 King William I had granted the manor to Geoffrey de Montbray, Bishop of Coutances. By 1122 Geoffrey de Clinton, chamberlain of Henry I of England held the manor. From about 1585 Thomas Tesdale of Abingdon leased the manor from the Cupper family who had held it since John Cupper bought it in 1547. Tesdale was a maltster, but at Glympton he raised cattle and grew woad for dyeing. Tesdale died in 1610 leaving £5,000 for scholarships and fellowships from Abingdon School to Balliol College, Oxford. His widow Maud Tesdale died in 1616. Thomas is commemorated by a brass memorial on the chancel floor in St Nicholas' parish church. He and Maud are also commemorated by an alabaster double monument set into the north wall of the chancel, in which almost life-size effigies of the couple kneel opposite each other at a prayer desk. In 1633 the manor was bought by William Wheate, whose grandson Thomas Wheate was created a baronet in 1696. The Wheate Baronetcy became extinct on the death of the 6th Baronet in 1816, but the family and their descendants continued to hold the estate until 1944. In the Second World War Major Frank Wheate Barnett (1906–40) was a staff officer in the King's Royal Rifle Corps and died of wounds at the Battle of Dunkirk on 2 June 1940. Glympton Park is a country house that was built for the Wheate family in the 18th century. At the same time the River Glyme was dammed to form the lake in the park. The house was remodelled in 1846. Prince Bandar bin Sultan of Saudi Arabia has owned Glympton Park and its estate since 1992. The Church of England parish church of Saint Mary was originally Norman and still has its Norman font. The nave was rebuilt in the later Middle Ages. The bell tower was added in the 16th or 17th century. The chancel was rebuilt and the nave was rebuilt again in the 1730s. In 1872 the Gothic Revival architect G.E. Street had the chancel rebuilt, the Norman chancel arch enlarged, new windows inserted in the nave and a new porch and vestry added. The tower has a chime of five bells, the oldest of which was cast in 1784. The building has also a Sanctus bell that was cast in 1705. St Mary's is now part of a single benefice with Asterleigh, Kiddington and Wootton. Both the Domesday Book of 1086 and the Hundred Rolls of 1279 record Glympton as having a watermill. The mill was rebuilt in 1292 and 1326, but by 1362 was in such disrepair as to be worthless. In 1632 Glympton was said to have two mills but in 1659 there was only one. It was last recorded in 1724 and had gone by 1767. In 1154 woodland in the south of the parish was taken into the royal forest of Wychwood. To some extent this was disafforested in about 1300. At about the same time villagers expanded their fields by assarting, which is the process of clearing woodland for cultivation. At least 23 acres (9 ha) of assart land changed hands in 1322, by 1426 one of the manors had 46 acres (19 ha) of assart land, and in 1631 the paris's assarts were estimated at 500 acres (200 ha). Fields or furlongs with names ending in "-ley" suggest an origin as assarts, including Lutches Ley, Edamesley, and Bradeley. The name of Glympton Assarts Farm, about 1 mile (1.6 km) south of the village, is further evidence that villagers assarted southwards into the Wychwood. Glympton village used to be grouped around the parish church. However, William Wheate moved the entire village about 1⁄4 mile (400 m) southeast to make way for the landscaping of Glympton Park, apparently in the 1630s or 1640s, leaving the parish church isolated in its original position. The gate lodge to Glympton Park was probably built at this time, and despite a restoration in 1880 the lodge remains essentially a 17th-century house. Apart from the parish church, no trace remains of the original village. Of the relocated 17th century village none of the original houses survives either. One 18th century inn survives as a private house. All the remaining houses in the relocated village were either remodelled in the 19th century or built new in the 20th century. Glympton's farmland was enclosed earlier than that of many other parishes. There were records of some enclosures having taken place by the early parts of the 14th, 15th and 17th centuries. After William Wheate bought the manor in 1633 he began enclosing the remainder, and after 1690 Sir Thomas Wheate, 1st Baronet completed the process by agreement with his tenants. The main road through Glympton was once part of the main road between London and Aberystwyth. It and the Oxford — Stratford-upon-Avon main road through the parish were made into turnpikes in 1729. Both roads ceased to be turnpikes in 1878. Since the 1920s the road has been classified as the B4027 and the Oxford – Stratford road has been the A44. Glympton's first record of a public house is from 1648. By 1780 it had two inns, the Pole Axe and the Swan, presumably deriving some of their trade from the then turnpike roads passing through the parish. The Pole Axe had closed by 1784 and The Swan in about 1853. In the 18th century a Middle Jurassic limestone, possibly part of the Taynton Limestone Formation, was quarried at Glympton and used to build parts of Glympton Park house and Blenheim Palace. It had poor resistance to frost, so at Blenheim John Vanbrugh used it only for internal walls or for backing external walls that were faced with better stone. If it was used originally for facing at Glympton Park, it must have been replaced when the house was rebuilt in 1849, as its facing is now entirely in Bath stone. The village school was built in 1849 and became a Church of England School in 1903. It was reorganised as a junior school in 1922 and closed in 1932. In 1950 the building was converted into the village hall. By 1869 Glympton had 22 cottages. A government report found them to be soundly built, let at a rent of 30 shillings per year, and "often paid for by selling the product of the apricot tree planted against the side of their houses". The village post office was opened in 1887 and continues to serve the village. In 1949 the owner of Glympton Park had a row of four almshouses built at Glympton. When their site was being prepared, a hoard of coins from the reigns of James I and Charles I was found, possibly dating from the English Civil War. In 1646 Royalist troops requisitioned food and carts from the village and in 1648 up to 50 Parliamentarian soldiers were billeted here. 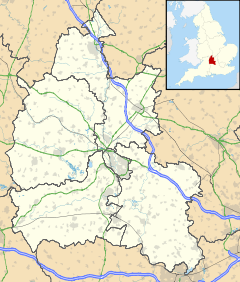 ^ "Area selected: West Oxfordshire (Non-Metropolitan District)". Neighbourhood Statistics: Full Dataset View. Office for National Statistics. Archived from the original on 22 June 2011. Retrieved 29 March 2010. ^ a b c d e f g h i j k l m n o p q r s Crossley 1983, pp. 120–131. ^ Historic England (9 April 1951). "1km section of the north Oxfordshire Grim's Ditch running from Out Wood to Berring's Wood (1012906)". National Heritage List for England. Retrieved 27 June 2013. ^ a b c Sherwood & Pevsner 1974, p. 613. ^ Milmo, Cahal (21 June 2000). "Clinton may have a second chance to inhale the academic air of Oxford". The Independent. London. Retrieved 3 May 2010. ^ a b c Sherwood & Pevsner 1974, p. 612. ^ Archbishops' Council (2010). "Glympton: St Mary, Glympton". A Church Near You. Church of England. Retrieved 19 March 2011. ^ Palmer, JJN. "Place: Glympton". Open Domesday. Anna Powell-Smith. ^ Taylor 1975, pp. 75–77. ^ Arkell 1948, p. 54. ^ Arkell 1948, p. 53. Arkell, W.J. (1948). "The building-stones of Blenheim Palace, Cornbury Park, Glympton Park and Heythrop House, Oxfordshire" (PDF). Oxoniensia. Oxford Architectural and Historical Society. XIII: 49–54. ISSN 0308-5562. Barnett, Rev. Herbert (1923). Glympton – the History of an Oxfordshire Manor. Oxford University Press. Emery, Frank (1974). The Oxfordshire Landscape. The Making of the English Landscape. London: Hodder & Stoughton. p. 172. ISBN 0-340-04301-6. Sherwood, Jennifer; Pevsner, Nikolaus (1974). Oxfordshire. The Buildings of England. Harmondsworth: Penguin Books. pp. 612–613. ISBN 0-14-071045-0. Thomas, Nicholas (1957). "Excavations at Callow Hill, Glympton and Stonesfield, Oxon" (PDF). Oxoniensia. Oxford Architectural and Historical Society. XXII: 11–53. ISSN 0308-5562. Taylor, Christopher (1982) . Fields in the English Landscape. Archaeology in the Field Series. London: J.M. Dent & Sons Ltd. pp. 75–77. ISBN 0-460-02232-6.